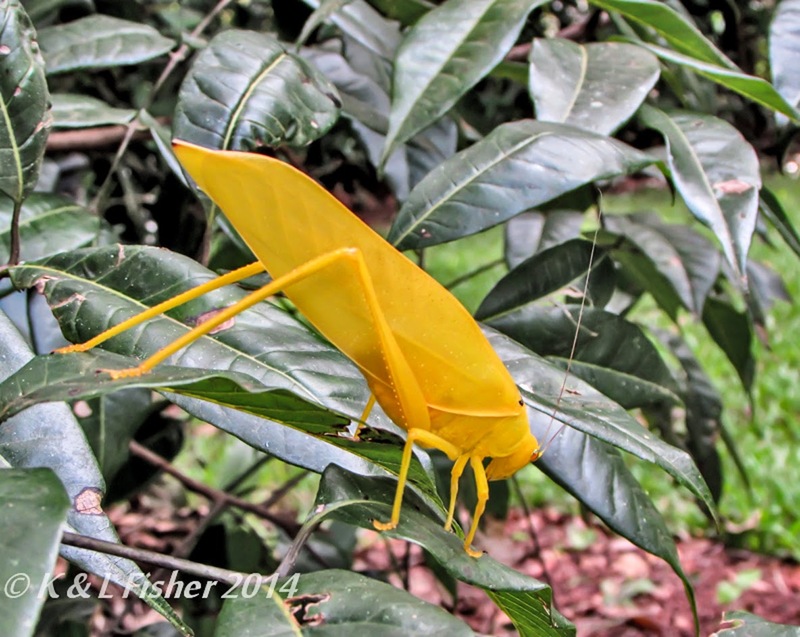 Lindsay Fisher took this photo of a rare yellow morph of the Serrated Bush Katydid, Paracaedicia serrata Brunner. Odd colour morphs of this and other katydids appear from time to time. In fact, a pinkish morph, photographed by Jack Hasenpusch, was on the cover of the Guide to Australian Katydids. 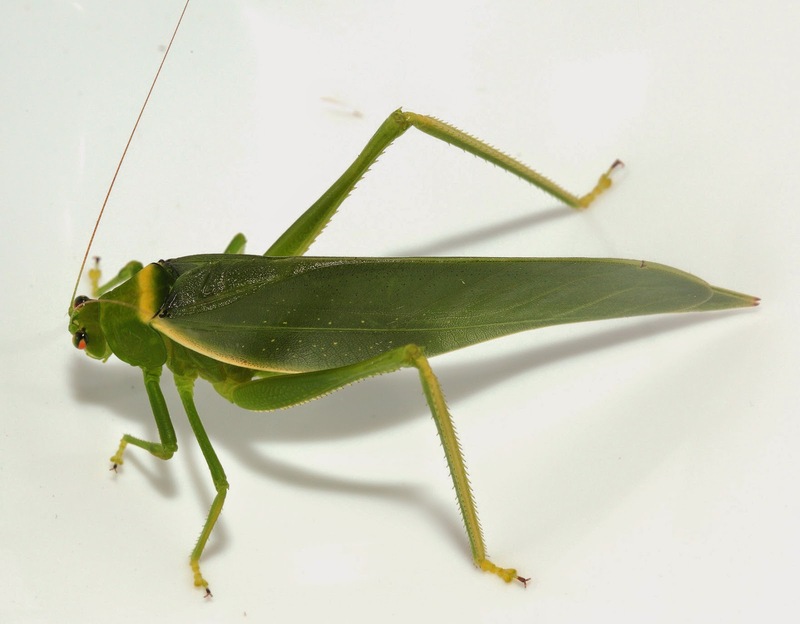 P. serrata is normally a green katydid. 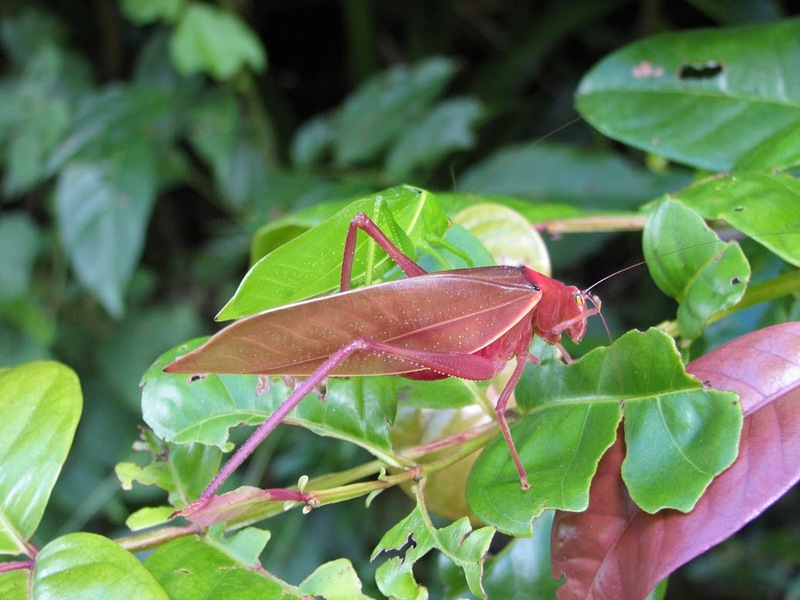 This katydid lives in the coastal rainforests of northern Queensland. It probably lives well off the ground in dense foliage. 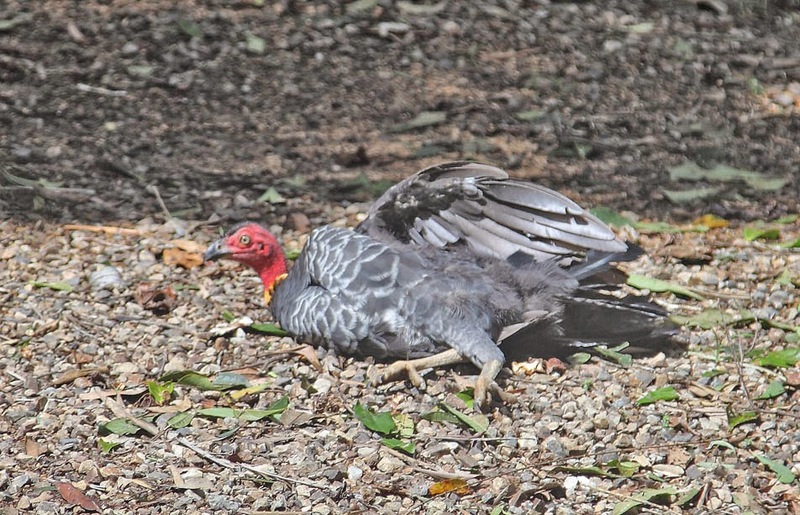 It, like many others of its subfamily, probably feeds on foliage. It frequently comes to lights after dark. It gets its specific name from the serrated appearance of the hind femur. The serrations are actually stout spines. It is a robust species and large (approximately 60-70 mm in length) and would present formidable opposition to a bird or lizard that attempted to subdue it. The structure of the thorax with its expanded musculature is responsible for its hump-backed appearance. This results in its strong flying capabilites. 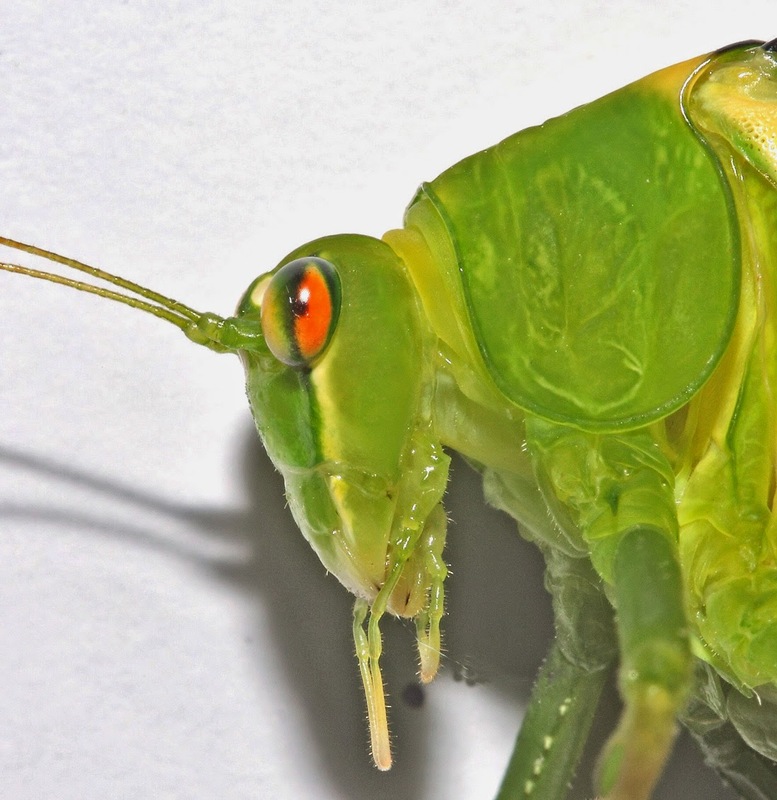 Eye colour and patterns on the head of katydids are generally species-distinctive but taxonomists studying dead bugs are usually unaware of the colours because they are not preserved with most preservation methods and they also fade with time. This is a disadvantage because they are not only beautiful but add sets of characters that can be used in classification. 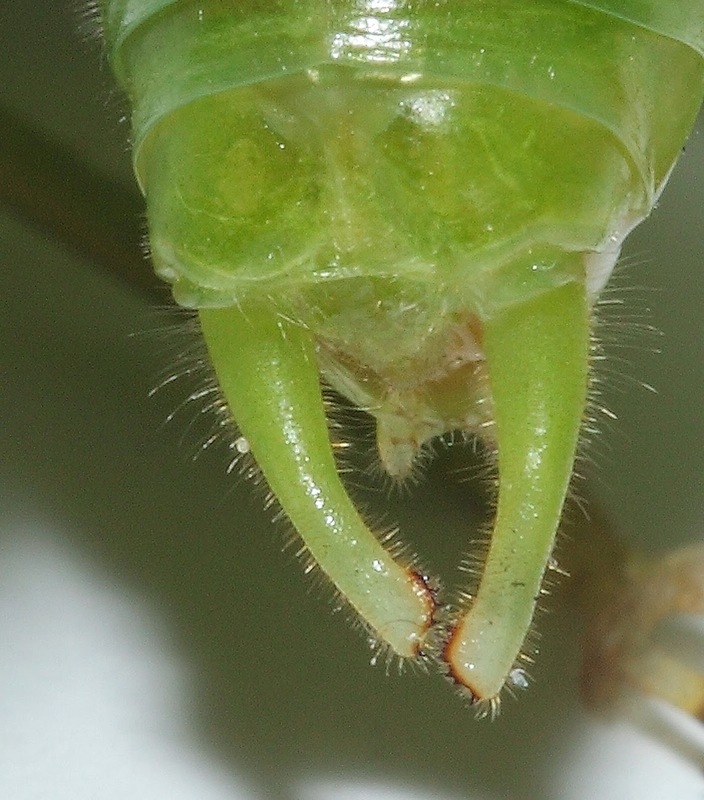 The morphology of the male clasping organs provide one of the most distinctive features of katydids. The teeth fit into equally distinctive pockets on the abdomen of the female. This has been called the "Lock and Key" theory in the distant past. If the key is not of the structure to fit the pocket, then there is no successful copulation. This is probably true most of the time but it is the odd occasion when a mating takes place between members of different species that hybrids can result. 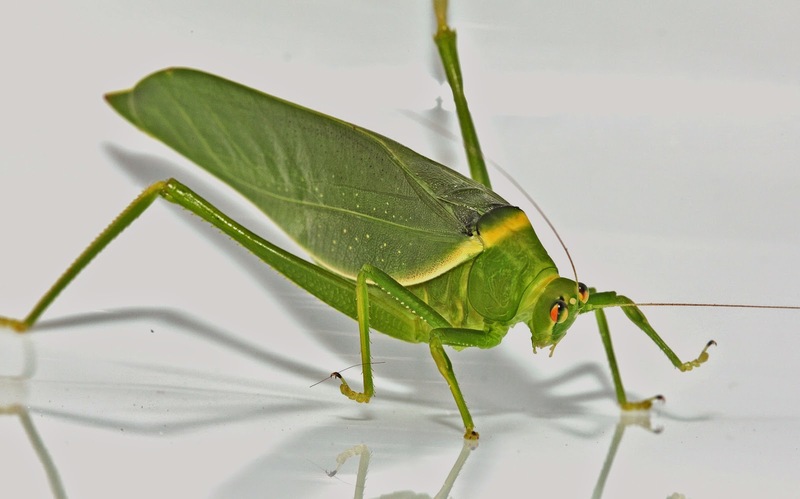 Of interest to a limited number of readers is a recent proposed name change to the classification of katydids. Formerly the family to which this and the greater majority of katydids belong is the Tettigoniidae. This family has been divided into many subfamilies and from time to time these subfamilies have been raised to family status. In general, these escalations have been ignored by taxonomists. This katydid is a member of the subfamily Phaneropterinae and has been once again elevated to family status, now the Phaneropteridae. This changes the status of hundreds of genera. This change was based on a suite of morphological characters borne on extant and fossil species and DNA analysis. Four subfamilies are included in the new Phaneropteridae: Mecopodinae, Phyllophorinae, Pseudophyllinae and the Phaneropterinae. Only time will tell if taxonomists accept these changes but the evidence seems overwhelming at this point. 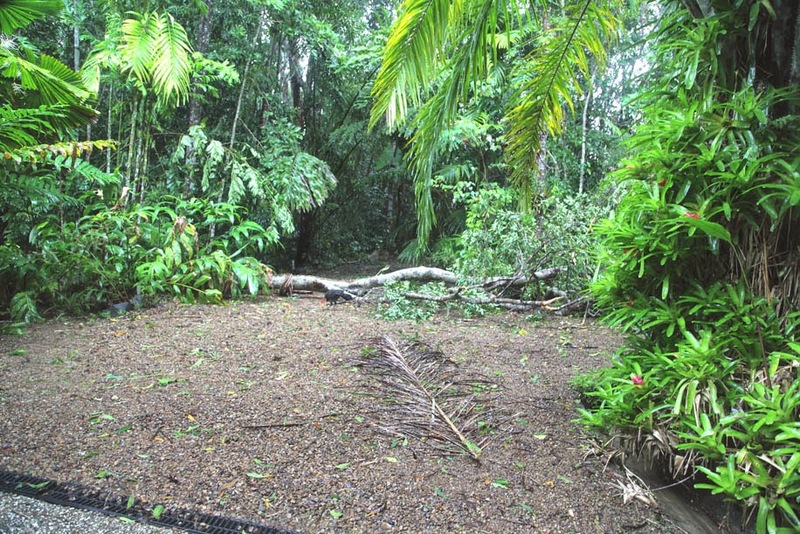 Cyclone Ita visited Australia via the Solomon Islands where it did considerable damage due to winds and flooding. 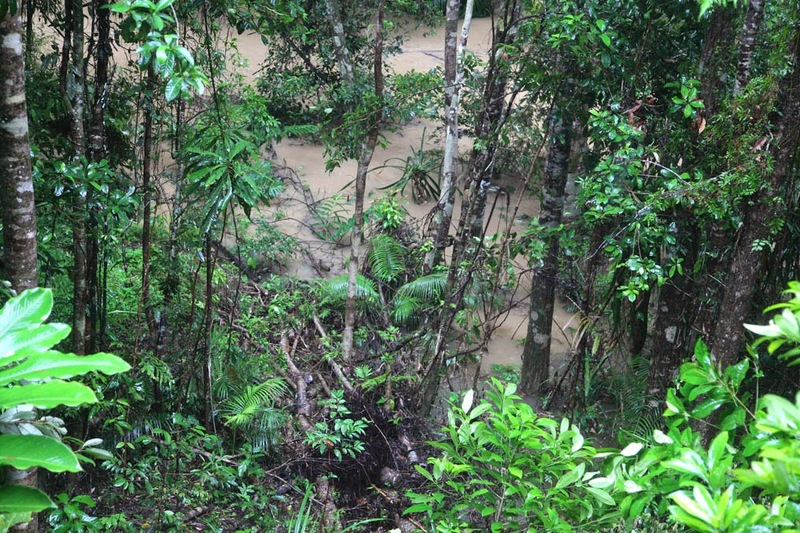 It built up strength hitting the mainland north of Cooktown as a Category 5 storm, the maximum on the scale of 1-5. Once it hit the mainland it tracked south very slowly causing much chaos to tropical crops like bananas. The cyclone lost strength once it was over land and continued its southward journey as a Category 1 storm. The "eye" passed over Kuranda. But at that stage Ita had done its deed. The rain stopped, the wind stopped and that was it. There was just a shower overnight. 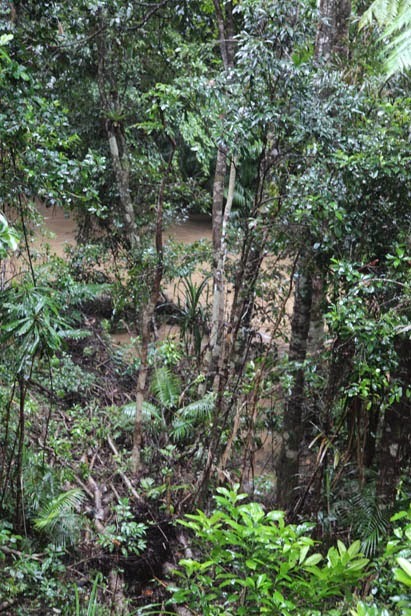 Rainfall at Kuranda during the storm: 181 mm 12 April; 206 mm 13 April; 14 mm 14 April. Cyclone Ita travelled inland well to the south of Cairns and then eventually tracked out to sea over the Whitsunday Islands where we visited just a week before. 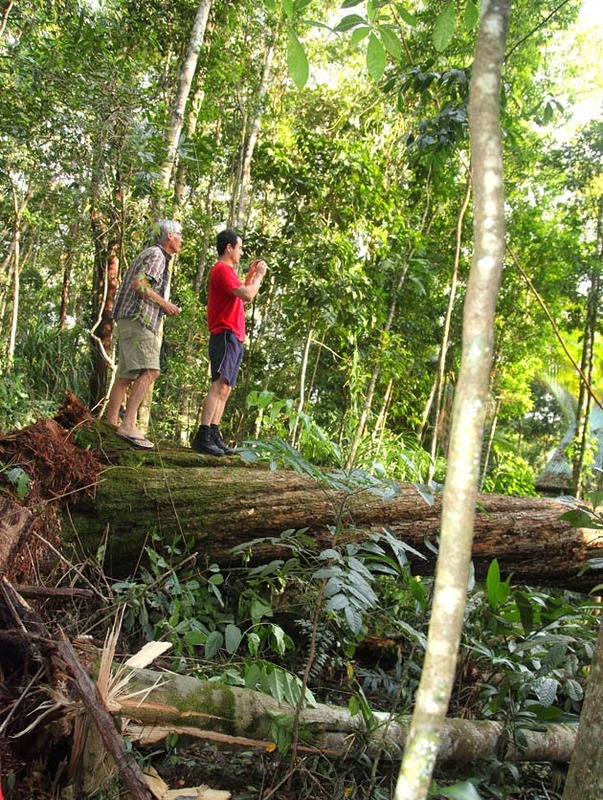 Damage around Kuranda was spotty. 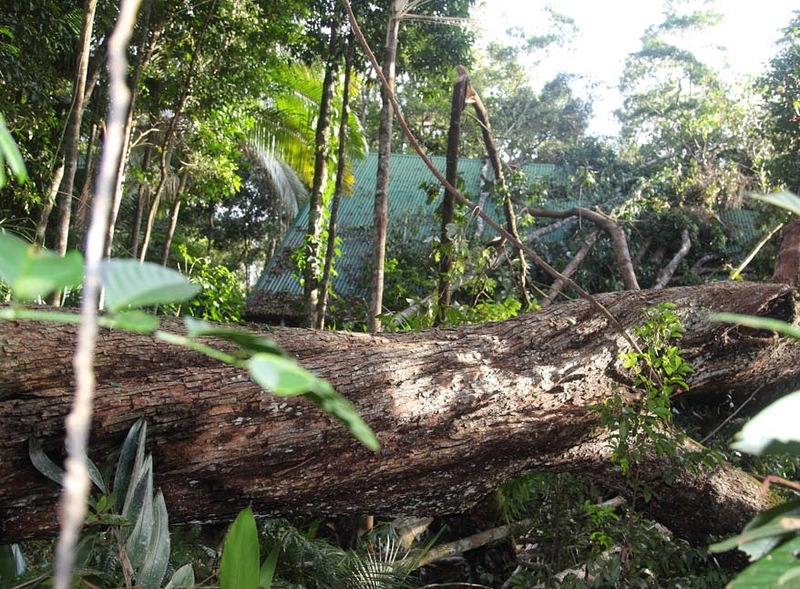 It was a major catastrophe if a tree hit your house, but just a nuisance otherwise. The creek at flood. It passage was slowed due to fallen trees and shrubbery but it is back to normal now. this was the extent of our damage-a small tree across the driveway. The tree that fell on this garage missed the solar panels in the front. But others were not so lucky. 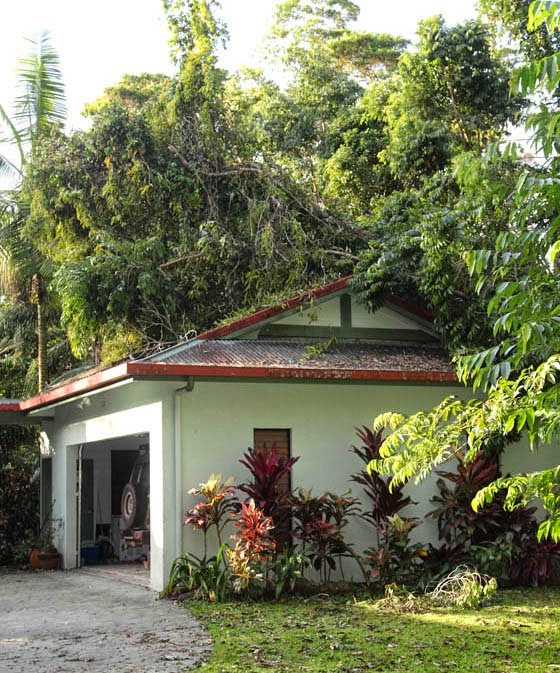 This large Black Wattle, about a metre in diameter fell onto a house down the street. Fortunately, the owners were away and there was little subsequent rain. Considering the size of the tree, there was relatively little damage. Max and Philip standing on base of tree. An awful site for the owner when they return from their trip. 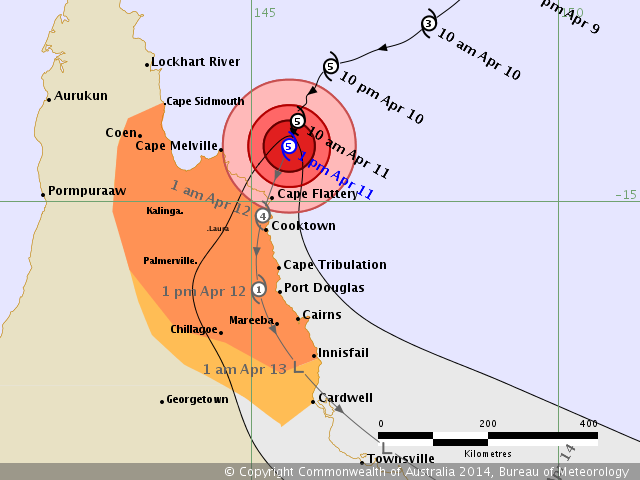 In precis, the cyclone was much more restrained than we expected when it came ashore north of Cooktown. There was relatively little damage to the Cairns business district. The sulphur-crested cockatoo, Cacatua galerita, can be found all over Australia from sea level to tree-line in the high mountains and on adjacent islands. Four geographic races have been described. 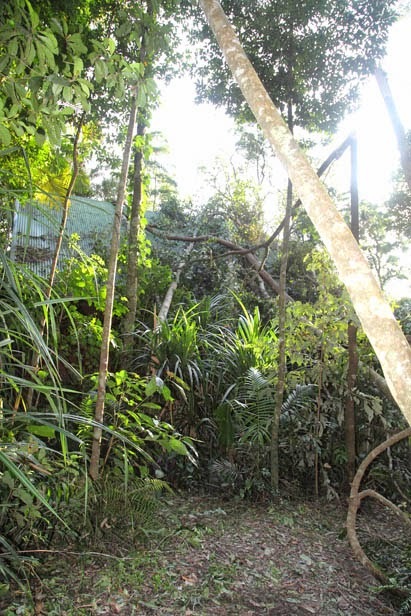 They also occur in New Guinea and on many islands such as Aru, Waigeo and Misool. Cockatoos are popular pets. They can live for many decades and are often included in wills. They can no longer be exported from Australia but many make the northern pet trade through illegal exports from adjacent non-Australian territories and breeding by aviculturalists. They attract handsome prices outside Australia. 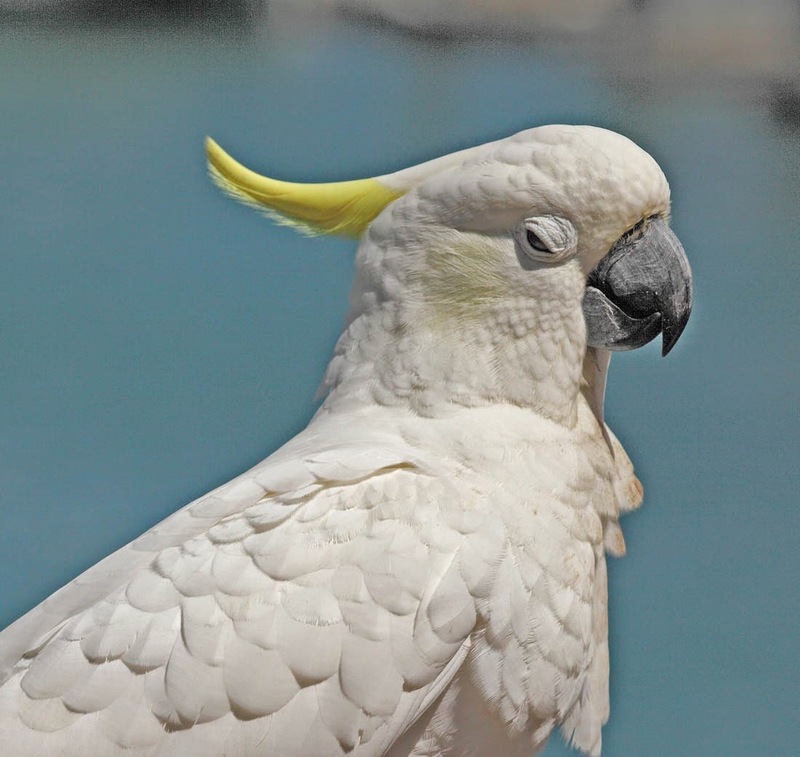 Cockatoos have a very loud, raucous call-probably a protective "strategy" that puts off potential predators. They cause mega-damage to fruits and nuts and farmers are allowed to shoot pesky individuals. Cockatoos are quick to recognise potential food sources. They can descend on a bird feeder and empty it promptly. They have a great fondness for chewing on wood. 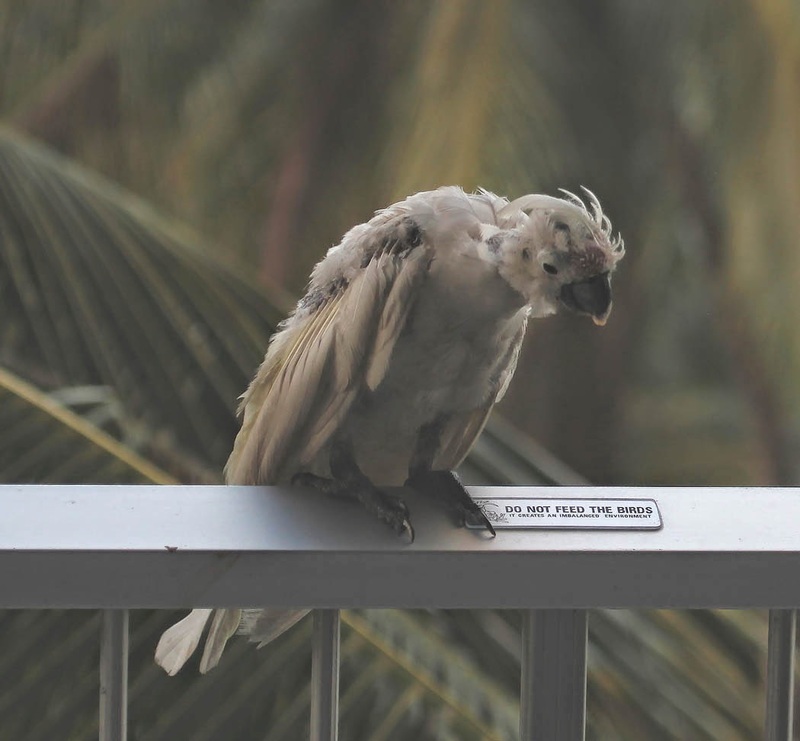 Garden furniture is at risk when cockatoos are around. The wander around on roofs and chew on molding and shutters causing great economic loss. 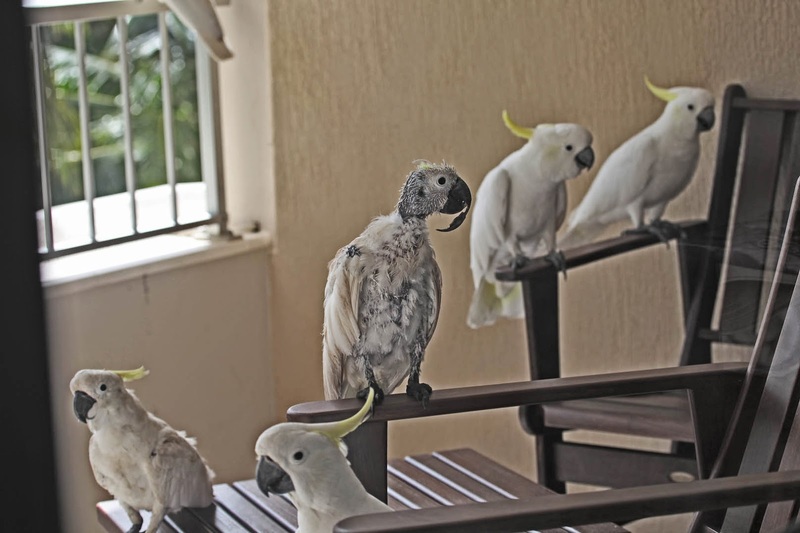 Resorts plead with visitors not to encourage the birds as they will often chew on furniture and even enter rooms in search of a free meal. 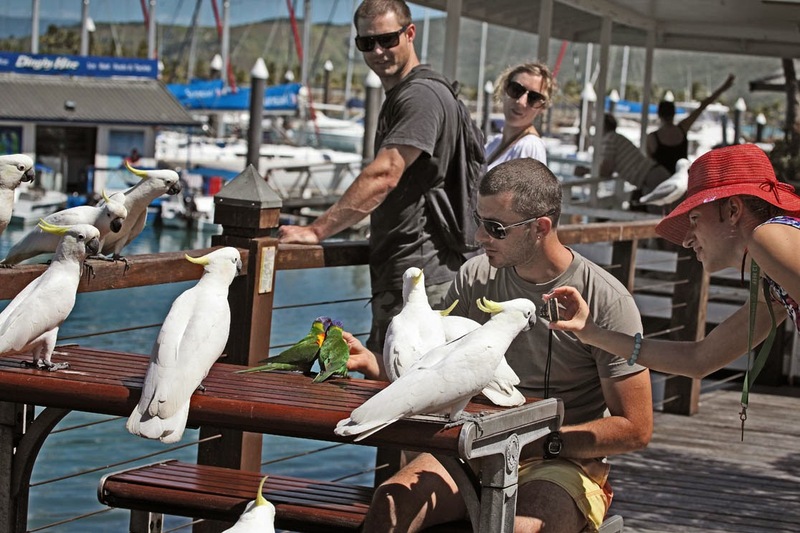 Cockatoos, as well as Rainbow Lorikeets, will gladly join you for lunch. Some bold individuals even take to the trash bins! Within a group of cockies, you will often find one or two rather moth-eaten individuals. Birds that look like this are suffering from Psittacine Beak and Feather Disease. This is a viral disease that is usually fatal. Some birds have an immunity to the ailment. It manifests itself in several ways. 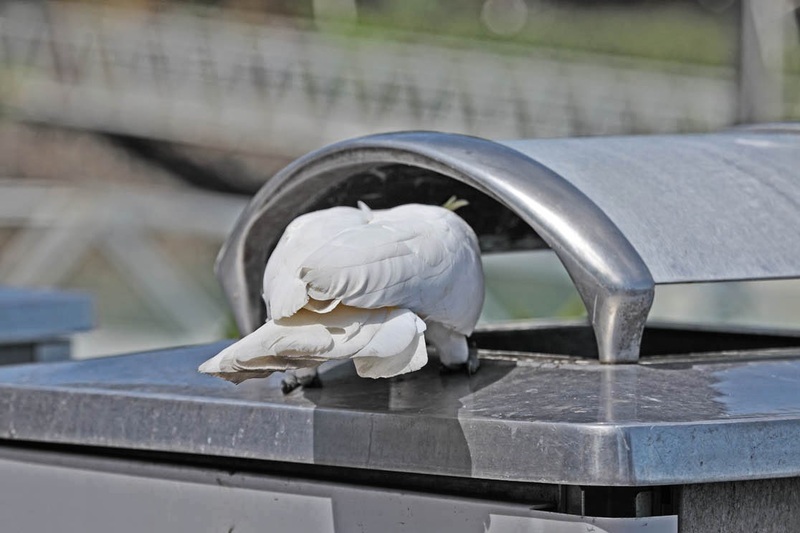 The bird's dander, the powdery coating on the feathers, is destroyed and the birds lose the ability to keep the feathers clean. So they always appear dirty. The feathers are affected. The shafts seem to not allow the feathers to open. There is feather drop and the topnotch is often lost. 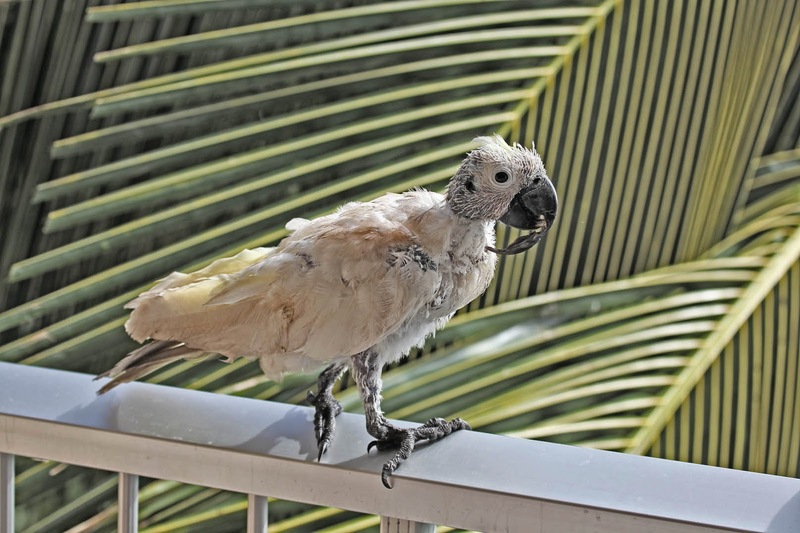 Birds acquire the infection in the nest and if they develop more or less normally, they eventually suffer diarrhea, vomiting and loss of appetite. One of the sadder aspects of the disease is that the beak is often affected and can even fall off. When this happens, the bird's ability to feed is greatly limited. Many parrot species can be affected by PBFD and it is disappointing to see a pet develop the symptoms and have to be euthanised.